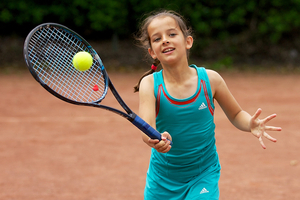 Rainford youngster Maisie Lavelle has won the 9 and Under Girls Singles at this week's Warrington Tennis Open. The nine year old won all of her matches at the tournament, which was played on the indoor courts at Birchwood Tennis Centre. In the final, Maisie saved three match points on her way to beating Wigan's Hannah Dumican in three sets. This was Maisie's second tournament win of the summer having won the Holcombe Brook Open in Bury in April. Maisie is coached at Rainford Tennis Club by Dave Hillier.